← Jessy J. Jams on! You can tell when a group of musicians have mojo. It permeates the music and leaves the audience with a sense of euphoria and a silly grin that only appears after witnessing something wonderful. I know that after seeing these sessions hosted by Brian Culbertson, you’ll know exactly what I’m referring to. 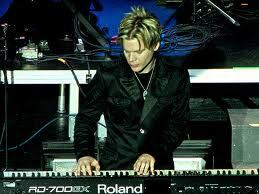 Brian Culbertson is a master pianist and trombone player. He proves his skill each time he gets close to an instrument. Born in Decatur, Illinois to a band director and trumpet player, one sees where his skills as band leader emanate. Not only does Brian play, write and produce, he knows how to assemble a great group of musicians and how to get them to lay down a groove. In this first video you will recognize many familiar faces, especially that of saxophone extraordinaire, Eric Darius. Here they perform “Back in the Day” and “So Good.” If you have the CD “Live from the inside,” here are a few of the corresponding videos tracks shot at Capitol Recording Studio in Hollywood, CA. Watch and be part of this incredible recording session. Brian Culbertson to date has released 12 CDs. We expect many more yet to come. He is young, energetic and a prolific composer. I look forward to what our readers think of this post! Please share it with your friends. Enjoy the music and be well. This entry was posted in Artists and tagged Brian Culbertson, contemporary jazz, Dave Koz, Eric Darius, funk, smooth jazz. Bookmark the permalink.